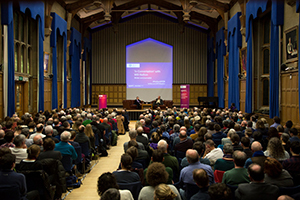 Over 400 people braved the rain on Friday night to listen to Will Hutton, one of the most eminent political economists in Britain. 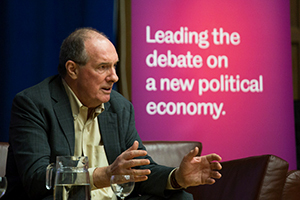 In the grand setting of Firth Hall, Tony Payne co-Director of SPERI introduced the event and highlighted how Will Hutton had predicted back in 2011 the rise in protectionism and the imminent trade conflict between the US and China before leaving the stage to Professor Andrew Gamble. Andrew’s first question to Will shed light on his journey from stockbroker to journalist. His time as a stockbroker in the 1970s made him realise the UK’s ‘vulture-like capitalist model’ which shaped the direction of his future work. Will Hutton is the author of 11 books with the most renowned being ‘The State We’re In’. In this book he argues that the free market economic model has been detrimental to social cohesion by creating one of the lowest paid workforces and the highest paid executives in Europe. At Friday’s event Will stated that ‘we are living through a 21 Century political coup by the right’. He recognised that Blair and Brown failed to challenge vested interests of the elite but also critiqued Jeremy Corbyn’s leadership of the Labour Party. He had strong words about Brexit too calling it ‘the closest to a catastrophe that any developed country has inflicted upon itself’. Speaking of Donald Trump, Hutton gave a chilling view of the consequences of Trump’s government on global trade and peace in the Middle East and the South Pacific. On the French Presidential elections, Will predicts a victory by Emmanuel Macron. There was no shortage of questions in Q&A: the NHS, artificial intelligence and Basic Income were some of the issues covered. You can listen to the full audio of the evening or watch Andrew Gamble in conversation with Will Hutton below. Thank you to everyone who attended the event, asked questions and engaged with the debate on social media. You can read the storify here. Special thanks go to our volunteers, Sofia, Hannah, Ines and Sabrina and to Blackwells bookshop for displaying Will Hutton’s books.